Drug-induced liver injury (DILI) is important in the differential diagnosis in patients with abnormal liver tests and normal hepatobiliary imaging. A diagnosis of DILI is a challenge for health-care providers and probably one of the most difficult to establish among liver diseases. Antibiotics are the most common type of offending drugs reported in major studies of DILI. The incidence of DILI caused by antibiotics in some large prospective and retrospective studies ranged from 3 to 6 per 100,000 individuals,,,. Cephalosporins are widely used antibiotics and well tolerated. Most reports of cephalosporin-induced liver injury are case reports,,,,,, and these antibiotics account for about 1% of DILI in prospective studies,,. Cefepime is a parenteral fourth-generation cephalosporin with an extended spectrum of antimicrobial activity and is prescribed for a variety of hospital-acquired infections. It is considered well-tolerated and is associated with few adverse reactions. Although cefepime-induced neurotoxicity and nephrotoxicity have been reported in recent years, there are currently no formal reports of hepatic injury caused by this drug. In this report, we describe an elderly man with no history of the liver disease who developed cholestatic hepatitis after administration of cefepime. The Roussel Uclaf Causality Assessment Method (RUCAM) was used to quantitatively assess causality in the medication-induced liver injury in our patient. A 93-year-old man presented to the emergency room of a teaching hospital with a 4-day history of progressive dyspnea and general fatigue. He complained of dizziness, exertional dyspnea, and productive cough. The patient denied other constitutional and abdominal symptoms except for poor appetite. His medical history included dementia, chronic obstructive pulmonary disease (COPD), diabetes mellitus, congestive heart failure New York Heart Association functional classification III, and macrocytic anemia without a definite diagnosis for 6 years. He refused medical control for heart failure and COPD and took some over-the-counter iron and vitamin supplements. In the past 2 years, he had developed frequent dyspnea even at rest, and general malaise resulting from severe anemia with hemoglobin (Hb) levels down to 3–4 g/dL and acute exacerbation of COPD. He had been receiving blood transfusions, initially once every 2 months, but this had increased to every 2 weeks over the past 2 months. He was an ex-smoker and had smoked 1 pack per day for 40 years but had quit 30 years previously. He had no history of liver disease, excessive alcohol consumption, recent travel, infectious symptoms, intravenous drug use or environmental exposure history. He had been admitted twice for pneumonia, once 2 years ago and again 3 months ago. Cefuroxime was given during his first admission, and amoxicillin 875 mg/clavulanic acid 125 mg intravenously was used in the second admission. Other medications including ipratropium bromide and terbutaline sulfate solutions by nebulizer, methylprednisolone, and furosemide intravenous injection were given each time he came to the emergency department for red-blood-cell transfusions and concurrent acute exacerbation of COPD over the past 2 years. The physical examination in the emergency department revealed he was afebrile with a clear consciousness, regular heartbeat at 92 beats/min, pale conjunctivae, and mild wheezing. The jugular vein was not engorged. There was no lymphadenopathy, abdominal tenderness, hepatosplenomegaly, or stigmata of chronic liver disease. Laboratory results showed severe normocytic anemia with an Hb level of 4.5 g/dL. The white blood cell (WBC) and platelet counts were normal. The serum total bilirubin was mildly elevated (1.28 mg/dL), but the hepatic enzymes and renal profile were normal. There were elevated levels of C-reactive protein (CRP) 1.38 mg/dL and N-terminal pro-brain natriuretic peptide 2905 pg/mL. A plain chest radiograph showed some reticular interstitial infiltration over the subpleural and bilateral lower lung fields. There was no interval change compared with 2 months previously. The initial peripheral oxygen saturation (SpO2) was 98% under ambient air, but he experienced diffuse wheezing with SpO2 88% under nasal cannula 3 L/min 1 h after arrival. Despite use of a non-rebreathing mask with O2 15 L/min, ipratropium bromide and terbutaline sulfate inhalation, the patient became stuporous and arterial blood gases showed respiratory acidosis and hypoxemia (pH 7.276, PaCO2 63.3 mmHg, PaO2 46.2 mmHg). He was intubated and transferred to the Intensive Care Unit (ICU) 3 hours after arrival. On admission to the ICU, the patient had sinus tachycardia of 124/min but no shock, and a fever with a body temperature 38.5°C. Although chest radiography after intubation showed no new lung lesions or pulmonary edema, empiric cefuroxime intravenous injection was given for purulent sputum from endotracheal suction, which suggested a secondary lower airway infection. Ipratropium bromide, terbutaline sulfate, and mechanical ventilation were used for acute exacerbation of COPD with hypercapnic respiratory failure. Furosemide and candesartan cilexetil were given for heart failure. On the 3rd hospital day, his respiratory distress had improved and the bronchodilators were shifted to salmeterol 25 mcg/fluticasone 125 mg (Seretide Evohaler 125). The initial cultures from the blood, urine, and sputum were negative, and cefuroxime was stopped 1 week after admission. Investigation of anemia showed no active bleeding on physical examination and a negative stool occult blood test. The reticulocyte production index was 0.1. A blood smear and autoimmune profile showed no evidence of intravascular or extravascular hemolysis. Serum Vitamin B12, folate and iron levels were higher than normal (Vitamin B12 3876 pg/mL, normal range: 211–911 pg/mL; folate 44 ng/mL, normal range: >5.31 ng/mL; iron 196 μg/mL, normal range 65–175 μg/mL). The blood ferritin level was 6237.7 ng/mL (normal range 22–322 ng/mL), and total iron binding capacity was 204 μg/mL (normal range 250–450 μg/mL). The transferrin saturation (TSAT) was 96%. The blood lactate dehydrogenase level was 222 IU/mL. The patient refused a bone marrow biopsy. He had mildly elevated levels of serum aspartate transaminase (AST) 43 U/L, alkaline phosphatase (ALP) 163 IU/L and gamma-glutamyltransferase (γGT) 326 IU/mL. The blood albumin level was 3 g/dL, and alanine transaminase (ALT) and direct-bilirubin levels were normal (40 U/L and 0.68 mg/dL, respectively). The B-and C-viral hepatitis profiles were negative. There was no evidence of occult malignancy with normal blood tumor marker levels. Abdominal sonography showed a tiny polyp o 3.4 mm in the gallbladder, but otherwise negative findings over the hepatobiliary system. No splenomegaly or portal vein congestion was found. To avoid further iron overload, a blood transfusion was given once on admission to keep the hemoglobin 7–8 g/dL. In the following 3 weeks, the patient was treated for recurrent ventilator-associated pneumonia [Figure 1]. From day 8 to day 14, ceftazidime was given. Teicoplanin was given from day 20 to day 30 for pneumonia associated with oxacillin-resistant Staphylococcus aureus and a second red-blood-cell transfusion was given on day 21 for persistent fresh bloody sputum. On day 25, cefepime was given for a new fever (38.2°C) due to Pseudomonas aeruginosa pneumonia. On day 32, jaundice and tea-color urine were observed. There was no anorexia, vomiting, abdominal pain, or sore throat and the stool was dark brown. A physical examination showed the patient had a clear consciousness with icteric sclerae and pale conjunctivae. His blood pressure was 131/74 mmHg, t heart rhythm was regular at 80/min, and respiratory rate was 18/min under a mechanical ventilator fraction of inhaled oxygen of 35% and SpO2 96%. There were no signs of pharyngitis, neck lymphadenopathy, hepatosplenomegaly, skin rash, or petechiae. The laboratory study showed a normal hemogram (WBCs 8950/μL, segmented forms 60.5%, lymphocytes 28.3%, monocytes 9.6%, eosinophils 1.6%, Hb 7.9 g/dL, and platelets 317 × 103/μL) and normal renal function. Liver biochemistry and function tests showed direct-type hyperbilirubinemia with a total bilirubin of 9.53 mg/dL, ALT 86 U/L, AST 104 U/L, ALP 515 U/L, and γGT 707 IU/L. Serum albumin, prothrombin time, and thyroid function tests were within the normal ranges. A second abdominal sonography still showed no abnormal findings in the hepatobiliary structures. DILI with cholestatic hepatitis was impressed. RUCAM scores for suspect drugs were 7 for cefepime, 6 for ceftazidime and 4 for teicoplanin [Supplement Table 1]. Cefepime was the most likely offending agent. It was discontinued on day 32 and ciprofloxacin 400 mg every 12 h intravenously and inhaled colistin 133.6 mg every 8 h were used according to drug susceptibility tests for P. aeruginosa pneumonia. Four days after discontinuing cefepime, the serum total- and direct-bilirubin levels decreased to 3.67 and 2.29 mg/dL, respectively. The total-bilirubin and ALT levels returned to the normal ranges on day 64 (1.04 mg/dL and 50 U/L, respectively). AST decreased to 56 U/L on day 64. The ALP level peaked at 523 IU/L 4 days after cefepime was discontinued and decreased to 490 IU/L on day 49. There was no further follow-up of ALP and γGT after day 49. Treatment after day 32, including red-blood-cell transfusion and medications, did not cause liver biochemistry deterioration. 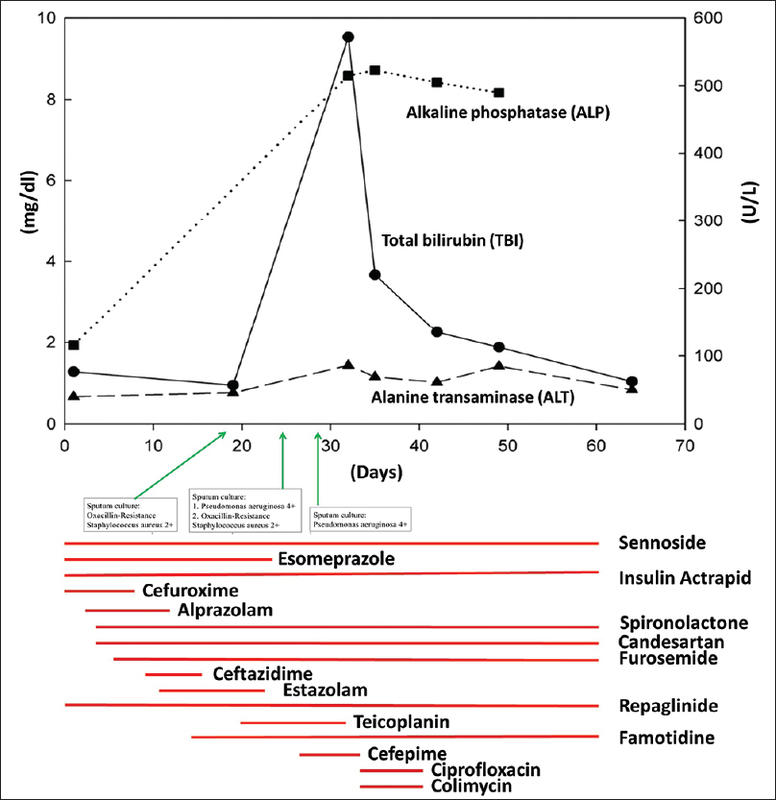 [Figure 1] shows the dynamic changes in liver blood tests including total-bilirubin, ALT, and ALP with all medications used during hospitalization. On day 43, the patient was successfully weaned off the ventilator and was discharged 1 month after extubation to a nursing home for further care. According to the manufacturer, cefepime-related hepatic side effects include increased serum ALT (3%), abnormal partial thromboplastin time (2%), increased serum AST (2%) and abnormal prothrombin time (1%). Hyperbilirubinemia and elevated serum ALP and γGT due to cefepime have never been reported. The U. S. DILI network (DILIN) prospectively reviewed 1212 patients between 2004 and 2012. Nineteen of the 1019 DILI cases (2%), were attributed to cefazolin, which was the 6th most common agent identified in the study. The characteristic presentation was a delayed cholestatic or mixed hepatocellular-cholestatic liver injury onset 1–3 weeks after a single intravenous injection of the antibiotics. Pruritis (100%) and jaundice (95%) were the most prominent symptoms or signs, and the course was self-limiting. Fourteen cases of DILI were attributed to non-cefazolin cephalosporins in the study including one of cefepime. That patient had mixed hepatocellular and cholestatic liver injury 20 days after a 7-day course of cefepime. The serum total bilirubin was prominently elevated (11.3 mg/dl) with eventual complete recovery. The liver blood tests returned to baseline 90 days after the intravenous cefazolin injection. Our patient was classified as having cholestatic DILI with acute increasing serum total bilirubin levels which decreased 4 days after discontinuing cefepime, and returned to normal 32 days after, stopping the drug. Ceftazidime was another possible offending agent for DILI in our patient since its RUCAM score was only 1 point less than the score for cefepime and both drugs were in the “probable” category in the DILI causality assessment. The main difference was that the observed liver insult occurred during cefepime use when ceftazidime had not been used for over 2 weeks. Although hyperbilirubinemia and increased liver enzymes were reported in ceftazidime postmarketing surveys, the elevations were transient and mild, s and no clear incidence was ever reported. Cephalosporin-induced liver injury resembles that associated with amoxicillin/clavulanic acid. The presentation included a delayed cholestatic or mixed liver injury with recovery after stopping the drugs,. An immunoallergic reaction to a structural component of the beta-lactam 4-ring molecule shared by both kinds of antibiotics was speculated to be the cause. Our patient had taken amoxicillin/clavulanic acid and cefuroxime previously without liver injury. We were not sure if the cause was sensitization to beta-lactam antibiotics after repeated exposure or an idiosyncratic reaction to cefepime. ALP and γGT were slightly elevated in our patient on admission and did not return to normal during the whole hospitalization course. These, along with the elevated conjugated bilirubin level usually hint that the patient has hepatobiliary or infiltrative liver disease. The former was excluded by negative abdominal sonography. Some comorbidities in our patient which could result in chronic liver disease had to be considered before a diagnosis of DILI. These included congestive heart failure, chronic anemia of unknown etiology and iron overload related to chronic transfusion. The most common liver biochemistry abnormality in congestive hepatopathy is a mild elevation in the serum bilirubin level (usually <3 mg/dL) with predominant unconjugated forms. Striking hyperbilirubinemia may be found in patients with severe acute right-side heart failure. Our patient did not have symptoms and signs of decompensated congestive heart failure when he developed conjugated form predominant hyperbilirubinemia. There was also no worsening of the lung condition such as hypoxia or acute exacerbation of COPD that might have resulted in right heart failure. Abdominal sonography showed that the inferior vena cava and hepatic veins were not dilated. The laboratory studies did not support findings of acute or chronic hemolysis in our patient. The former two diseases were not likely responsible for the patient's acute liver injury. We suspected our patient had transfusional iron overload based on a history of blood transfusion >20 units, a high serum ferritin level and a TSAT >45% (96% in our patient). Confirmatory diagnosis of iron overload with liver involvement mandates a liver biopsy or liver magnetic resonance imaging, which were not done in our patient due to his critical status. Chronic or acute inflammation, chronic liver disease, and alcohol use may confound ferritin and TSAT measurements, but a low CRP level, initial normal liver enzymes, and clinical findings excluded these states. Iron overload probably caused the slightly increased ALP and γGT levels in our patient, and this made the patient prone to acute liver injury. Acute viral hepatitis is important in the differential diagnosis of DILI. Serology studies for hepatitis A, B, C, E virus, cytomegalovirus, Epstein-Barr virus, herpes simplex virus, and varicella zoster virus are required in RUCAM when assessing DILI. In our patient, we only excluded hepatitis B and C viral infection by serology test. We did not complete the study because the clinical presentations in our patient were not compatible with acute viral epatitis. The patient had no symptomatic illness, which begins with an abrupt onset of nausea, vomiting, anorexia, fever, malaise, and abdominal pain. Laboratory findings in acute viral hepatitis usually include significant elevations of serum aminotransferases (often >1000 international units/dL) and mild to moderate degree of elevation in serum bilirubin (typically ≤10 mg/dL) and ALP (up to 400U/L). This is in contrast to the findings in our patient. Full clinical and biochemical recovery in acute viral hepatitis usually is observed within 2–6 months but our patient's serum bilirubin level declined in 1 week and was completely normal in 1 month, which was more compatible with a previous study of cefazolin-induced DILI. Our patient also had no cervical lymphadenopathy, splenomegaly, absolute lymphocytosis, or atypical lymphocytes, which are suggestive of CMV and EBV infections. Thus, an extensive viral hepatitis study seemed unnecessary. Cholestatic DILI occurs in 20%–40% cases,. Mortality from DILI with jaundice due to antibiotics was reported in approximately 10% of patients and/or they needed liver transplantation,. Björnsson reviewed antibiotic-induced liver injury and some risk factors for the development of cholestatic DILI were identified. These included old age, dose-dependent effect with administration of medications in dosages greater than 50 mg a day, drugs with 50% or greater hepatic metabolism, certain genetic traits (mainly polymorphism in human leukocyte antigen [HLA] class II) and chemical properties of the drugs (e.g., high lipophilicity associated with cholestatic liver injury),. The clinical patterns from DILI patients include vanishing bile duct syndrome (VBDS), secondary sclerosing cholangitis, and acute and chronic cholestasis. In a recent DILIN cohort, 26 of the 363 patients (7%) with drug, herbal or dietary supplement-associated liver injury had VBDS and were more likely to have chronic liver injury compared with those who did not have VBDS (94% vs. 47%; P < 0.001). High liver-related mortality (26%) was found compared with 6.2% mortality in the 899 DILI patients in the entire DILIN cohort. The need for liver transplantation was 8% in VBDS patients and 4% in the overall cohort. Of note, the risks of cholestatic DILI and hepatic toxicity are higher in patients taking multiple medications because of their potential to cause DILI. We excluded the possibility of drug-drug interactions according to the Drug Interaction Probability Scale. The patient was not rechallenged with cefepime, but his bilirubin level gradually recovered after stopping the drug. Thus, cefepime was considered the cause of cholestatic liver injury in our patient. Cholestatic DILI is a rare side effect of cefepime. However, clinicians should be aware of this adverse effect as this antibiotic is frequently prescribed. We suggest that clinicians carefully monitor hepatic parameters in patients treated with high-dose cefepime or in those likely to receive a prolonged course of this antibiotic. The authors certify that the patient has obtained an appropriate patient consent form. In the form, the patient has given his consent for his images and other clinical information to be reported in the journal. The patient understands that his name and initials will not be published and due efforts will be made to conceal his identity, but anonymity cannot be guaranteed. Watkins PB. How to diagnose and exclude drug-induced liver injury. Dig Dis 2015;33:472-6. Björnsson ES. Drug-induced liver injury due to antibiotics. Scand J Gastroenterol 2017;52:617-23. Andrade RJ, Lucena MI, Fernández MC, Pelaez G, Pachkoria K, García-Ruiz E, et al. Drug-induced liver injury: An analysis of 461 incidences submitted to the Spanish registry over a 10-year period. Gastroenterology 2005;129:512-21. De Valle MB, Av Klinteberg V, Alem N, Olsson R, Björnsson E. Drug-induced liver injury in a Swedish university hospital out-patient hepatology clinic. Aliment Pharmacol Ther 2006;24:1187-95. Björnsson ES, Bergmann OM, Björnsson HK, Kvaran RB, Olafsson S. Incidence, presentation, and outcomes in patients with drug-induced liver injury in the general population of Iceland. Gastroenterology 2013;144:1419-25, 1425.e1-3. Ammann R, Neftel K, Hardmeier T, Reinhardt M. Cephalosporin-induced cholestatic jaundice. Lancet 1982;2:336-7. Bilici A, Karaduman M, Cankir Z. A rare case of hepatitis associated with cefprozil therapy. Scand J Infect Dis 2007;39:190-2. Longo F, Hastier P, Buckley MJ, Chichmanian RM, Delmont JP. Acute hepatitis, autoimmune hemolytic anemia, and erythroblastocytopenia induced by ceftriaxone. Am J Gastroenterol 1998;93:836-7. Skoog SM, Smyrk TC, Talwalkar JA. Cephalexin-induced cholestatic hepatitis. J Clin Gastroenterol 2004;38:833. Peker E, Cagan E, Dogan M. Ceftriaxone-induced toxic hepatitis. World J Gastroenterol 2009;15:2669-71. Agrawal A, Rao M, Jasdanwala S, Mathur A, Eng M. Cephalexin induced cholestatic jaundice. Case Rep Gastrointest Med 2014;2014:260743. Product Information: MAXIPIME(R) IV, IM Injection, Cefepime HCl IV, IM Injection. Princeton, NJ: Bristol-Myers Squibb Company; 2009. Available from: http://www.micromedexsolutions.com/. [Last accessed on 2018 Jun]. Danan G, Teschke R. RUCAM in drug and herb induced liver injury: The update. Int J Mol Sci 2015;17. pii: E14. Alqahtani SA, Kleiner DE, Ghabril M, Gu J, Hoofnagle JH, Rockey DC, et al. Identification and characterization of cefazolin-induced liver injury. Clin Gastroenterol Hepatol 2015;13:1328-3600. Product Information: FORTAZ(R) Intravenous Intramuscular Injection, Ceftazidime Intravenous Intramuscular Injection. (per FDA). Cary, NC: Covis Pharmaceuticals, Inc.; 2014. Available from: http://www.micromedexsolutions.com/. [Last accessed on 2018 Jun]. Lucena MI, Andrade RJ, Fernández MC, Pachkoria K, Pelaez G, Durán JA, et al. Determinants of the clinical expression of amoxicillin-clavulanate hepatotoxicity: A prospective series from Spain. Hepatology 2006;44:850-6. Dunn GD, Hayes P, Breen KJ, Schenker S. The liver in congestive heart failure: A review. Am J Med Sci 1973;265:174-89. Tong MJ, el-Farra NS, Grew MI. Clinical manifestations of hepatitis A: Recent experience in a community teaching hospital. J Infect Dis 1995;171 Suppl 1:S15-8. Evans AS. Infectious mononucleosis and related syndromes. Am J Med Sci 1978;276:325-39. Sundaram V, Björnsson ES. Drug-induced cholestasis. Hepatol Commun 2017;1:726-35. Björnsson E, Olsson R. Outcome and prognostic markers in severe drug-induced liver disease. Hepatology 2005;42:481-9. Chalasani N, Bonkovsky HL, Fontana R, Lee W, Stolz A, Talwalkar J, et al. Features and outcomes of 899 patients with drug-induced liver injury: The DILIN prospective study. Gastroenterology 2015;148:1340-52.e7. Bonkovsky HL, Kleiner DE, Gu J, Odin JA, Russo MW, Navarro VM, et al. Clinical presentations and outcomes of bile duct loss caused by drugs and herbal and dietary supplements. Hepatology 2017;65:1267-77. Horn JR, Hansten PD, Chan LN. Proposal for a new tool to evaluate drug interaction cases. Ann Pharmacother 2007;41:674-80.